Phew. Am I glad it's Friday. And I only worked 3 days this week. It's almost a full moon though which always makes my days in the pharmacy seem twice as long. Today I'd like to share with you some of my favorite moments from the past week. I'll be back next week with an update to our kitchen plus info on hosting a Pinteresting party! Get. Excited. Nate, Ike and I went to visit my parents last week. Ike made himself right at home in my parents recently updated guest bedroom. I should have snapped some pictures before we destroyed it. It was the big Iowa Hawkeyes versus Iowa State Cyclones football game last Saturday. It's the one football game I actually enjoy watching. Watch the video to see who Ike was voting for. The dog kills me. He does everything in life with such passion. My dad and I agree on many things in life. I was skeptical about his lastest food creation though. 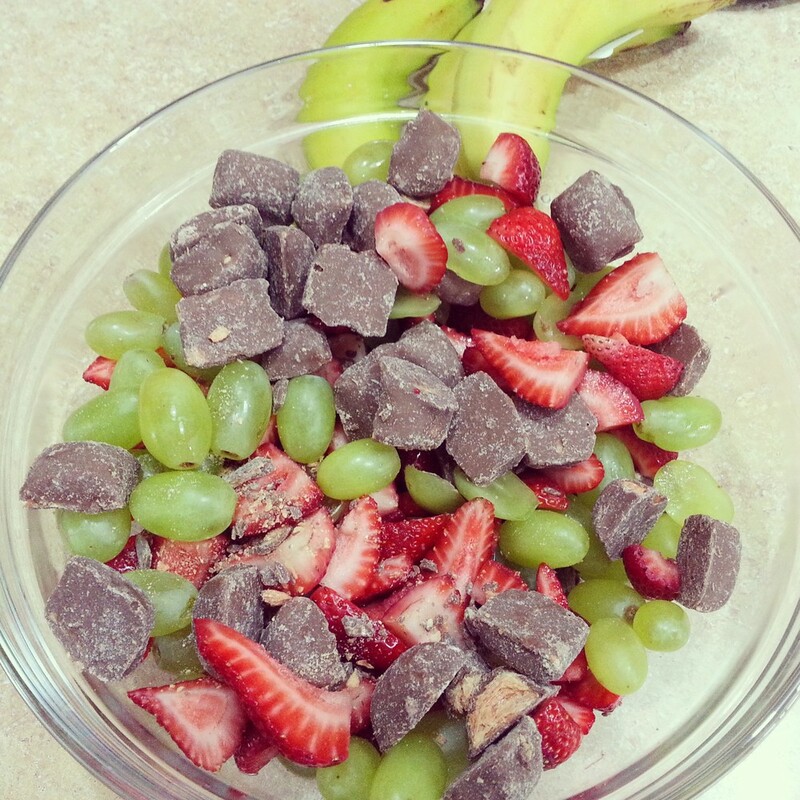 Fruit salad with Butterfinger Bits. He insists me the Butterfinger Bits are the croutons of the salad. I was really having a hard time believing it was good until I ate it. I will never doubt my dad again. Wait. I still doubt him when it comes to home decor. He misread the latest trends memo. 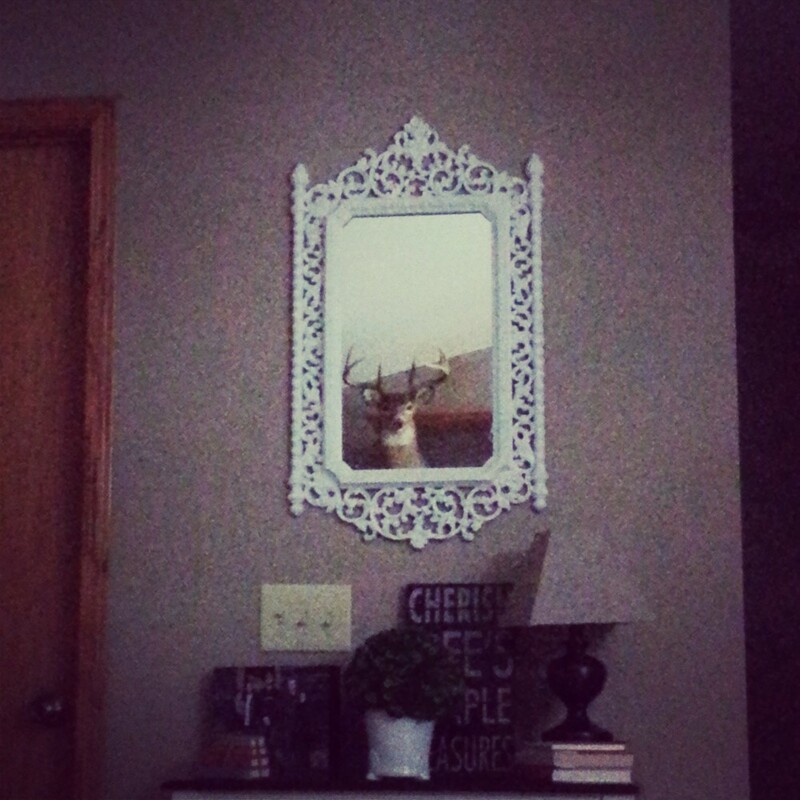 Faux taxidermy is trendy, not the real stuff. I kept feeling like someone was watching me when I would sit on the their couch. Always trust your instinct. Okay, time to head to work. Speaking of work, I was recognized at our staff appreciation day for 5 years of service. This is what happens to pharmacists after 5 years of working.